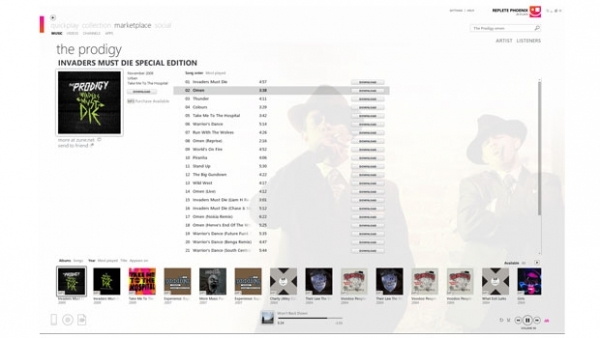 "If you're not ensnared in the bear trap that is iTunes, and you own a phone that doesn't have a lower case 'i' at the start, you might be wondering what to do about music. With Windows Phone 7 launching this week, Microsoft has finally brought its Zune store to the UK, and with it, the streaming and download service Zune Pass. Spotify is well established in the UK, with a multi-tier service that offers music for free -- ad supported -- and extra services if you're prepared to cough up £10 per month for its most feature-packed option. It's £1 more than Zune, and you don't get ten free downloads like you do with Microsoft's version, which is a shame. Let's have a look at both offerings and try to determine which one is worthy of your monthly subscription." CNet's Crave UK is an awesome source for music tech news, and they always bring flair to their reviews and writeups. This time they're comparing subscription services Zune, Spotify, and Napster. If that second name looks unfamiliar to those in the US, it's because at the moment Spotify is strictly limited to customers in Europe. My friends who have used the service swear by it, and it's easy to see why the free/cheap unlimited streaming service is easy to love. At the same time, the Zune pass has made strides with web access, smart DJ, and of course the Zune Social over the last few years. If you happen to live in the UK and are looking for a subscription service, definitely give the article a read.